I am still blown away. I just drove from Bridger, Montana to Shoshoni, Wyoming on highway 120. I have seen a lot of beautiful areas in the last six months; the Pacific coast, mountain roads and open areas, but nowhere changed the scenery as much as it did along highway 120. 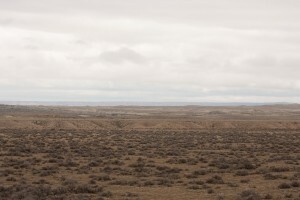 As soon as I crossed the invisible border from Montana into Wyoming the landscape changed. Gone were the trees, replaced by sagebrush. It had a rugged feel to it. I know this sounds familiar, believe me it was not the same as I had seen in Arizona, New Mexico, Oregon or Washington. Rolling hills to the east and impressive mountain ranges in the distance to the west and to the south, running perpendicular to the road. The mountain tops were shrouded in clouds. I was driving along the far eastern edges of the Shoshone National Wilderness which is home to mountains up to 12,000 feet and east of Yellowstone National Park. The weather today did not want to cooperate. The entire day was overcast with some occasional showers; despite all that this area was amazing. It had a real wild, wild west feel to it. The only things missing were the stagecoaches, cowboys and Indians. I would like to know what the first settlers must have thought when they rode through this very rugged desert area. All of a sudden something changed. 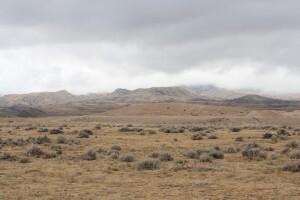 The sagebrush was no longer growing on brown soil, but it was now surrounded by yellow grass, giving it a nice contrast to the green of the sagebrush and the gray of the clouds. I just cannot image what it would look like with just a little sunshine. The landscape and colors continued to change. 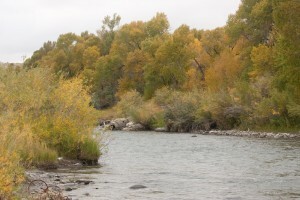 Riverbeds and small canyons appeared and disappeared just as quickly; filled with oak trees in their beginning stages of fall colors. Foothills moved further away or they changed shapes. Further south the hills had been washed clean of their dirt by rain and erosion exposing great rock formations. 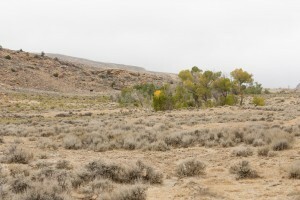 The dominant colors of the hills had been green (sagebrush) with gray rock. Before you knew it, Mother Nature added some great red rocks to the mix. I was completely baffled by all these changes in such a short distance; we are talking less than one hundred miles. I never knew what to expect on the other side a hill. 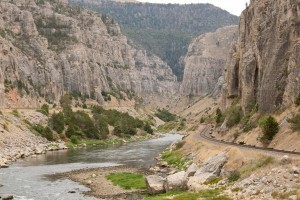 None of this, however, compares to the Wind River Canyon. OMG! (for those of you not familiar with this acronym – oh my God) just south of Thermopolis (this is the Hot Springs county) you drive through this canyon; the Bighorn River to your right flanked on both sides by 300 million year old canyon walls; just astounding. How do I know that they were that old? Well, Wyoming seems to care about their geology and they put up signs along the road pointing out the different kind of rocks and their age. Also, there were tons of pull outs which made it easy to admire these giants and to take pictures. Throughout this drive I had been wondering what these mountains would have to say if they could talk. Just think of all the changes in 300 million years. 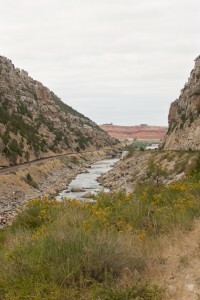 When I arrived at my campground right along side highway 20 and the Bighorn River, I was concerned about traffic noise. No need to worry, the wind is hauling so hard (the camper is rocking) and makes so much noise that it drowns out any traffic noise. The campground is deserted, besides myself there are only two other campers. Nice, creepy and worrisome make that down right scary all at the same time. One of those times I wished I wouldn’t be traveling by myself or at least have some cell reception. P.S. I made it through the night just fine. I woke up to some sunshine and fog making the mountains look mystical and just awesome.